As the nation's natural gas production booms, Democrats eyeing the White House may find themselves in a fracking fight. The fossil fuel has been called a "bridge" that could wean the nation off coal and help curb climate change. But wells and pipelines can leak methane, which is much more potent then carbon dioxide, and fracking has been tied to water and health issues. With the Green New Deal now a leading issue heading into the presidential election, Democratic contenders may face increased pressure to clarify where they stand. And the issue could split Democrats as hydraulic fracturing splits rock. Already pushing potential White House seekers is independent Sen. Bernie Sanders of Vermont. Last month the Oregon Legislature advanced a bill to ban fracking for 10 years. Sanders immediately praised the move. "Fracking pollutes water, degrades air quality and worsens climate change," he tweeted on March 19. "When we are in the White House we are going to ban fracking nationwide and rapidly move to renewable energy." Sanders is aiming to pull his primary challengers to the left on the issue — as he did in 2016. He and his supporters forced the Democratic National Committee to debate "fracking," the politicized buzzword for hydraulic fracturing, in the party platform and on the campaign trail. Sanders ripped the Obama administration after federal agencies in June 2016 found it was unlikely that offshore fracking would damage the environment. 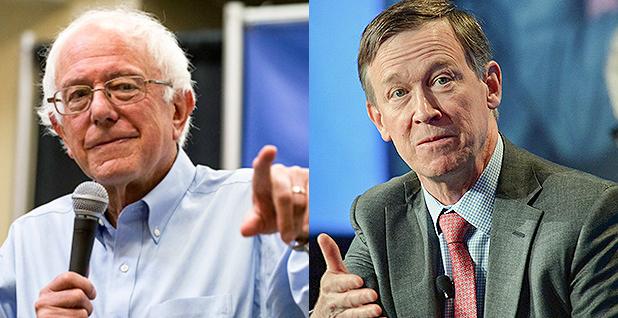 Several of the Democratic candidates have avoided specifying their positions in the past — with the exceptions of Sanders and John Hickenlooper, former Colorado governor and presidential candidate who supports fracking that is regulated. Former Texas Rep. Beto O'Rourke also has a record on the issue, but his precise position is murkier. While House Speaker Nancy Pelosi (D-Calif.) recently lauded him as an "environmentalist," he also has close ties to the oil industry. Last fall, he told the Midland Reporter-Telegram that natural gas production in Texas is cleaner than coal-fired plants in India and China. "I'd much rather they burn natural gas from Texas that's connected to jobs here," he said. Several other candidates have earned high marks from the League of Conservation Voters but have stopped short of calling for a fracking ban. One fracking bill, the "FRAC Act," which would have required oil companies to disclose the chemicals used in the process, never had a congressional hearing (Energywire, Nov. 2, 2018). Sen. Kamala Harris (D-Calif.) has said she was "skeptical" of fracking, The Sacramento Bee reported in 2016. Sen. Elizabeth Warren (D-Mass.) has called for stronger environmental protections, and Sen. Kirsten Gillibrand (D-N.Y.) has more recently opposed fossil fuels after calling fracking safe and economical in past years (E&E Daily, March 15). Sen. Amy Klobuchar (D-Minn.) has generally called for making the transition to "clean energy" in her infrastructure plan (Greenwire, March 28). Yet it remains to be seen if "fracking" will catch on as a key political issue in the primary race and where each of the Democrats would fall. If it does emerge, Jennifer Duffy of The Cook Political Report said Democrats would push back on Republican economic arguments by addressing "the costs to the community that result from fracking and the damage it does." A veteran energy lobbyist predicted that argument could resonate in states such as North Dakota, Ohio, Pennsylvania, Texas and West Virginia — where shale gas production surged in the last decade. Others doubted the issue would resonate beyond the affected communities. "Presidential candidates have largely moved on," said RL Miller, political director of Climate Hawks Vote. Yet Paul Bledsoe of the Progressive Policy Institute thought the primary race could generally shape up to be "the keep-it-in-the-ground crowd versus the environmental realists." "It could be that Sanders wants to pick this fight," Bledsoe said. The 2016 Democratic Party platform was silent on a fracking ban. Leading up to 2016, party insiders had fiercely debated the topic. Instead of a ban, they opted to "incentivize" renewable energy over new natural gas power plants. They also called for more federal oversight of fracturing. The issue caused conflict between Sanders and Hillary Clinton, exposing a rift in the party. Sanders prided himself as the only candidate willing to take on the fossil fuel industry (Climatewire, July 8, 2016). But Clinton's campaign believed such an absolute ban could actually impede methane regulations and other rules. In private emails, members of her campaign criticized Sanders' fracking position as too extreme but acknowledged that in states like Colorado the issue was dicey (Energywire, Oct. 13, 2016). Today, the politics are different. The sudden popularity of the Green New Deal has helped amplify climate change as a top-tier issue for Democrats in Congress for perhaps the first time in a decade, when Congress debated cap and trade. Around that time in 2010, the Oscar-nominated film "Gasland" was intensifying the issue of fracking for average Americans. "This brand-new movement on climate change — the Sunrise Movement — these people grew up watching 'Gasland,'" said the film's creator and director Josh Fox. "These people come from front-line communities." Fox said that objecting to the fossil fuel industry is key for Democrats in the 2020 elections. "If the Democrats are not with the total ban on fracking and with taking fossil fuel money, then they are heading down the same path that lost the election for Hillary," he said. Recent polling of likely Democratic voters shows that climate change is a leading issue, just trailing health care. Normington, Petts & Associates and Hart Research surveyed 1,765 voters in a handful of states that have early primaries. Specifically on fracking, the most recent national polls were conducted in 2016, when Gallup found 51 percent of Americans opposed it. That's an 11 percent increase from the year prior. There appears, however, to be no definitive data on American attitudes on fracking. Natural gas and oil have hit record production levels in the United States and dramatically changed the country's economy. Today, most wells drilled are high-volume hydraulic fracturing with long horizontal wellbores. The process involves bending the wellbore horizontally and then blasting fluids into the rock formation to extract more oil or gas. In essence, banning fracking in the United States would largely wipe out a huge swath of oil and gas production. Sanders has earned points in drought-ridden places like Colorado or Texas where fracking has become a flashpoint because of water issues. That sentiment has intensified as the Trump administration pushes to expand oil and gas drilling on public land. "Fracking" has also been an economic boon in states like Pennsylvania, which sits atop the lucrative Marcellus Shale play. Matto Mildenberger, political science professor at the University of California, Santa Barbara, noted there will be "so much desire to ensure that Pennsylvania returns to the Democratic column there won't be an appetite to contest this particular issue." Fracking proponents stressed that spending on natural gas per household has decreased by more than a quarter from 2008 and 2014. "So it's discouraging that so many lawmakers known for championing the economically disadvantaged stand opposed to domestic energy development," wrote Ohio conservative Paula Bolyard yesterday in RealClearEnergy. In general, debate exists in environmental circles about the extent to which natural gas has reduced greenhouse gas emissions in the past decade, Mildenberger added. The rise of cheap natural gas has pushed out coal plants, which emit about 50 percent more carbon dioxide when comparing new plants, data shows. But methane leaks from increased oil and natural gas operations — which are more potent than carbon dioxide — have negated emissions benefits to an unknown degree. Hickenlooper knows fracking well. He once famously drank frack fluid and as Colorado governor threatened to sue municipalities that enacted local bans. He later opposed a statewide fracking initiative. In a moderate fashion, he worked with the industry to strengthen methane rules. "He made clear where he stood," said Jeremy Nichols of WildEarth Guardians. "He genuinely believes we can frack our way to a safe climate. "The other candidates [need to] more clearly articulate where they stand on fossil fuel production," Nichols said. "It'll expose who the real leaders are." WildEarth Guardians has emphatically called for an end to all oil and gas production. It prides itself as being like a group of street fighters and has grown considerably in recent years. Still, many environmentalists argue that natural gas plays a role in the energy transition. "Shale growth has been a huge economic bonanza for a lot of the country, and I think there are Democrats who are really going to begin to make that case," Bledsoe said, adding that it could be a "popular position with most of the Democratic electorate." Frank Maisano, senior principal at the energy law firm Bracewell, added that shale production has spurred the development of renewables in the past decade. He said the Democratic candidates who target natural gas in the primary race could find themselves in an awkward position later on. "They are not talking to the mainstream voter right now. They are talking to the more progressive, environmentally conscious voter," he said. "Will they put themselves too far out there, so they can't pull back?"